Sunny Leone's "1 year 'gotcha' anniversary" post for daughter Nisha Kaur Weber is totally adorable. 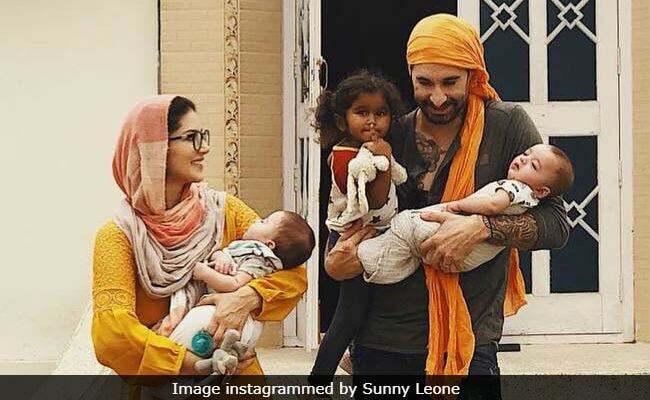 Sunny Leone and Daniel Weber adopted Nisha from an orphanage in Latur, Maharashtra last year and eight months later they announced the arrival of twin boys Noah and Asher Weber, who were born via surrogacy. Sunny Leone, who totally dotes on her daughter (her pervious Instagram posts are proof), shared a sweet note for Nisha, in which she said that she's a part of her "heart and soul." Along with the note, Sunny Leone instagrammed a picture of herself, Daniel Weber and Nisha from a photoshoot for which the couple was trolled last month. Sunny Leone captioned it: "One year ago today our lives changed when we brought you home with us. Today is your 1year "gotcha" anniversary and I can't believe it's only been one year because I feel I have known you a lifetime. You are a part of my heart and soul and the most beautiful baby girl in the world. I love you very much Nisha Kaur Weber." In May, Sunny Leone shared a picture of the crystal painting she made for her daughter, which took seven months to complete. "Dearest Nisha - with each stone I laid down I thought of you and how much I love you!" - To my little girl from Mumma," she captioned the post. Remember this post everyone from last Oct? 7months ago I started this big project. Thousands of crystals each laid down by my hand for my daughter Nisha. I finally finished it at 1am last night. I can't believe it's done! Longest it's ever taken me for one piece of art. "Dearest Nisha - with each stone I laid down I thought of you and how much I love you!" - To my little girl from Mumma! Before that Sunny Leone shared a lengthy note addressed to Nisha, in which she "promised to protect her from everything evil." I promise with every ounce of my heart, soul and body to protect you from everything and everyone who is evil in this world. Even if that means giving my life for your safety. Every child in the world should feel safe against the evil hurtful people. Let's hold our children a little closer to us! Protect at all costs!!!! Sunny Leone has featured in films like Jism 2, Ragini MMS 2, Kuch Kuch Locha Hai and Tera Intezaar among others. She co-hosts Splitsvilla with Rannvijay Singha. As of now, Sunny Leone is awaiting the release of her biographical web-series, titled Sunny Leone - The untold Story of Karenjit Kaur.